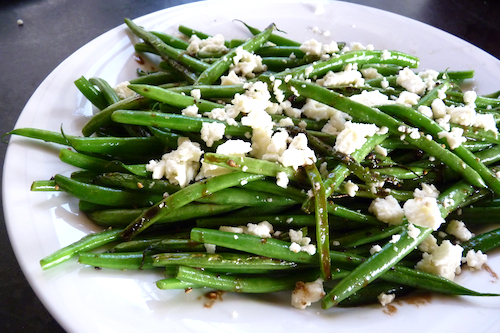 Cook greens beans like a gourmet chef with this delicious recipe! You can enhance the flavor of this recipe with our Oregano Balsamic. Snap ends off green beans. Wash and let dry in colander. Heat a skillet large enough to hold the beans comfortably (or cook in batches). Add olive oil to glaze the bottom of the pan. Add green beans to skillet. Be prepared for a lot of noise, as water from the green beans will pop in the oil. Use long tongs to give the green beans a quick turn in the skillet before covering the pan (this will allow the water to cook off without splattering your whole stovetop and also trap vapor in the pan to add steam to the cooking). You can also turn the beans by shaking the skillet, but I use cast iron, which is too heavy for this method. Turn the temperature down to medium low. When the popping has subsided, take the cover off and turn the beans again. They should have a nice coat of olive oil and be turning bright green. Add a 1/4 cup of water to the pan and cover, leaving the lid very slightly ajar for steam release. If the water doesn’t sizzle as soon as you pour it in, raise the heat a bit. This will give an additional steam cook for the beans. The amount of water and time of cooking now depends on the thickness of the beans and how well you like them cooked (though cooking much longer than crisp-tender will result in a duller color). In a minute, take the cover off, turn the beans and taste one. If it is done to your liking but there is still water in the pan, raise the heat to cook the water out quickly, turning the beans to release the steam. Otherwise, cover and cook another minute. Add a bit more water and repeat if required. Salt and pepper to taste. Turn beans over with tongs to distribute evenly. Drizzle with olive oil and a spoonful or two of balsamic vinegar, to taste. Serve hot or make ahead and serve at room temperature. Photo and Recipe from: Chinesegrandma.com and is licensed under a Creative Commons Attribution 4.0 International License. Ring in the New Year with this Strawberry-Balsamic Tequila Sour recipe! Fruits, vegetables, and nuts all topped off with fruity olive oil and balsamic? Yes, please! High Country Olive Oil is a purveyor of ultra premium extra virgin Olive Oils, aged Italian balsamic, fine specialty foods, body care products and gifts.